China’s e-comerce set another business record on Nov. 11 this year. Singles Day, now known as “Double Eleven”, even took the online shopping spree into brick-and-mortar stores and beyond the nation’s borders. This year’s shopping gala hit a new high of 168.3 billion yuan, around 25 billion USD up from the 120 billion yuan reached in 2016. Spending surged 39.3 percent during 2017’s sale, as consumers from 225 countries and regions took advantage of the annual jamboree to scoop up goods that included clothing, mobile phones and motor vehicles. 2017’s Single Days gala gained fresh momentum as overseas shoppers joined Chinese consumers searching for products and multinational corporations sought customers from China. According to data from AliExpress, Russia, Brazil, the United States, Spain, France, Ukraine, Israel, Belarus, Canada and the Netherlands have become the top 10 foreign buyers in terms of purchasing power. Women and the 25 to 34 age group are the main sources of the 100 million foreign online shoppers, the data showed. Revenues from international businesses reached 2.9 billion yuan, year on year growth of 115-percent. The mobile wallet Alipay processed deals at a peak rate of 256,000 transactions per second in some 200 countries and regions. We can see that “Double Eleven” has become a worldwide social synergy event. The synergy means joint efforts by global businesses and driven by technology and big data. It is a Chinese phenomenon with worldwide influence. Alibaba has created Haitao to help people in China buy foreign products, and TMall Global as a marketplace for foreign businesses to sell directly to Chinese consumers. Japanese brands Onward Crosset and Laox, for example, have Singles Day promotions at their shops on Tmall Global. But it’s not just sellers – many foreigners are also buying, according to Cyol.com. Singles Day attracts more and more overseas businesses, and it has become a huge opportunity for goods, capital, and culture to be exchanged around the world. Cross-border e-commerce platforms have made increased efforts to expand business abroad. Taking Alibaba as an example, its online payment app Alipay can now support 27 clearing currencies and serve users in over 200 countries. In today’s interconnected world, the shopping carnivals of China and the U.S. are connected. U.S. shoppers can buy goods in China on Nov. 11, while Chinese consumers can buy goods in the U.S. come Black Friday. Cainiao Network, the logistics arm of Alibaba, has established 266 cross-border warehouses in 224 countries and regions. Even European consumers can enjoy Nov. 11 as their Chinese and US counterparts do. Cainiao leased about a dozen flights on Nov.11 to carry Chinese goods to Europe. Many problems crop up because of this craze, such as order saturation, the leaking of personal information, and mountains of garbage from the packaging materials. In order to solve these problems, Chinese enterprises have developed some new, unique technologies to modrnize the consumption model. Offline stores also participated in this year’s shopping festival. According to China E-commerce Research Center, online-offline integration can help collect user data so that merchants can carry out targeted strategies to meet consumer demand. With big data, platforms can analyze the most popular goods in different places, so that different brands can distribute their goods more effectively. The customer will also get a faster delivery because there are sufficient goods nearby. Rural consumption is becoming a new driver for e-commerce growth in China. Growing demand for air conditioners, water purifiers, and refrigerators is apparent in the countryside. Some remote rural areas have not been able to receive express deliveries in the past. Rural Taobao and Cainiao Network runners prepared drones for this year’s Single’s Day shopping festival. 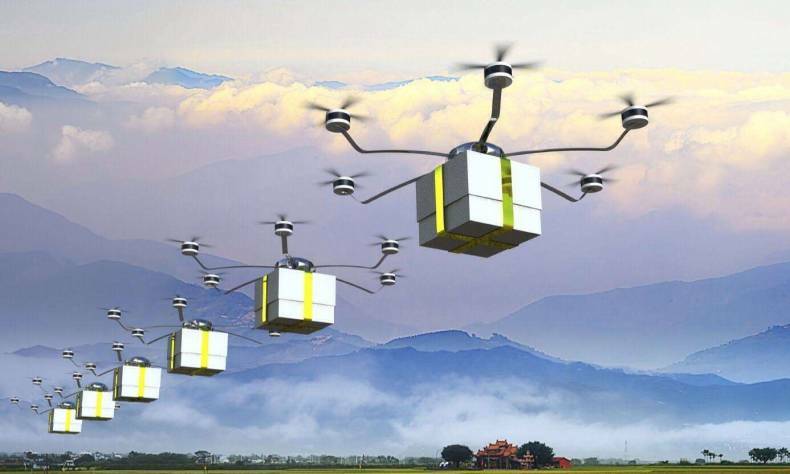 Each drone carried two boxes of products over water or mountains. This was the first time that China had used drones to deliver packages, which offers significantly shorter delivery time and is expected to ease the problem of poor transport links that affects remote areas. In the past, a customer’s name, cellphone number, and address could easily be obtained by strangers as the information was printed on the express box. The information is now hidden and the deliveryman calls you by scanning a code. We need no longer be pestered by unwanted calls. With a booming sharing economy, the Chinese people have accepted the idea that everything can be shared, and that goes for packaging too. Recycling express boxes seems to be the most direct solution for e-commerce enterprises who want both sustainable packaging and cost reductions. As retrieving used boxes from customers may be inconvenient, companies are considering sharing packaging between logistics firms and suppliers. Yet sustainable packaging is only one aspect of the eco-trend in the industry. New energy vehicles are also needed to make deliveries greener. Machines have largely replaced operators in China’s express delivery industry. At least 331 million packages were handled by Chinese postal and courier companies on Saturday’s Singles’ Day, 31.5 percent more than the same day last year, according to the State Post Bureau (SPB). In order to deliver these packages, the nation’s major couriers have launched auto-sorting systems to enhance their efficiency and accuracy. Delivery companies are increasingly turning to robots to sort their goods, which is fast and convenient. In China, Nov. 11 is the big shopping carnival. It became an online shopping event in 2009 when Alibaba’s TMall began promotions. In 2015, the number of participants reached 385 million. In 2016, the value of sales reached 1 billion yuan ($150.7 million) within 52 seconds, and the total number of orders during the shopping carnival topped 657 million. Alibaba’s sales this year hit 168.3 billion yuan (about 25.4 billion U.S. dollars), up from 120 billion yuan in 2016. What will the next year’s “Double Eleven” be like? Customers at home and abroad will wait and see.